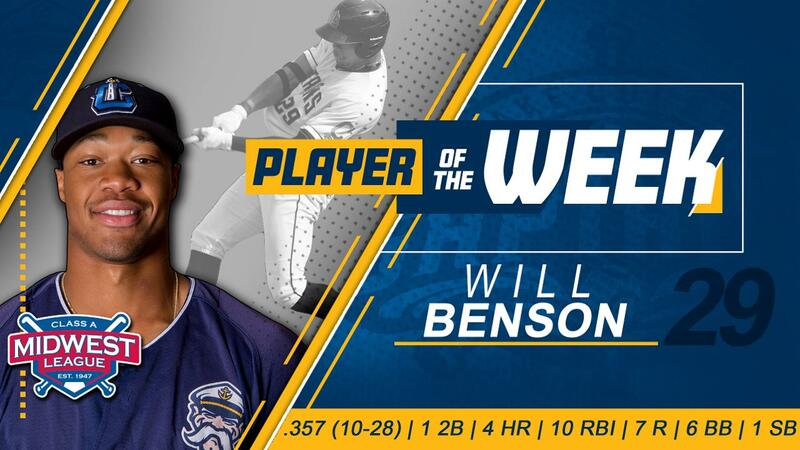 Benson, 20, hit .357 with one double, four home runs and 10 RBI in the season's final week to earn the player of the week honor. Benson was the Cleveland Indians' first-round draft choice in the 2016 MLB Amateur Draft. Will concluded the season with 22 HR and 58 RBI. Benson was named as a Midwest League All-Star and finished second in the Home Run Derby earlier this summer. Benson's big week sparked the Captains to win their final five games of the 2018 season. Opening Day in 2019 is April 4, when the Captains play host to the Great Lakes Loons at 6:30 PM. 2019 Season tickets, mini-plans and group outings are available now. Information about Classic Park and the Captains can be found online at captainsbaseball.com and by phone at 440-954-WINS (9467).